Hungary's Prime Minister Viktor Orban wins clear victory in elections, while Jobbik party increases its share of the vote. Hungary's Prime Minister Viktor Orban won a clear victory in elections on Sunday, and the openly anti-Semitic Jobbik party increased its share of the vote. "We can say with absolute certainty that we won," Orban told cheering supporters in Budapest, according to AFP. "These elections were free. Organized in a free country." With 89 percent of votes counted, Orban's Fidesz party was on 44.8 percent of the vote, well ahead of the opposition alliance on 25.5 percent. The anti-Roma and anti-Semitic Jobbik party looked to have increased its share to 21.0 percent from 16.7 percent at the last election in 2010. 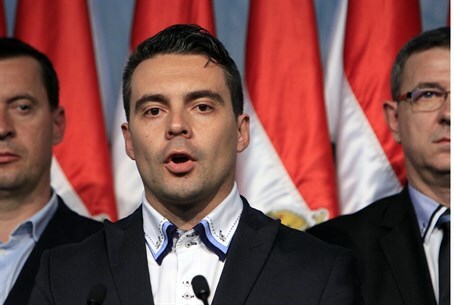 Jobbik, which calls itself a "radical nationalist" movement focused on law and order and attacking corruption, was already the third-largest party in parliament. The party has been behind many of the anti-Semitic attacks in Hungary in recent years. In November of 2012, one of Jobbik’s members released a statement saying that a list should be compiled of all of the Jewish members of government. He was followed by another Jobbik member who called publicly for the resignation of a fellow MP who claimed to have Israeli citizenship. In February, the party chose to hold a political rally in a former synagogue, while anti-fascist demonstrators outside accused the group of "provocation." Orban has pledged to fight anti-Semitism, which he said was "unacceptable and intolerable," but has been accused of not doing enough against it.